Put the bed under the window if you want to enjoy a stylish and decorative look. The framed window can function as the extension of the bedroom headboard. It can serve as the focal point in the bedroom. Thus, you can create a sense of unity since the headboard and window frame can be combined for a single focal point. If the large window in the bedroom is less dramatic to view, you can decorate it using the attractive curtain. Evoke the sense of luxury by adding the beautiful valances at the top of the window. If you want to skip the window decoration and make the bedroom wall look simple, you can cover it using the floor to ceiling shelves. The large window will be hidden. The wall to wall drapery is another option if you do not want to cover the entire large window. You can choose the blackout drapery to block the harsh sunlight. Find ways on how to arrange bedroom with a couch here. If you want to use the window as the focal appoint, the furnishing on the wall should be simple. For instance, you can have a picture of landscape on the wall. The nightstand can feature the potted cacti or potted flower. The corner furniture arrangement is nice to have in the bedroom. You can set a corner wall cabinet which can increase the storage space. A corner chair is also nice to spot at the corner. You can increase the comfort of the people who access the bedroom. Get ideas on how to arrange bedroom with a daybed here. 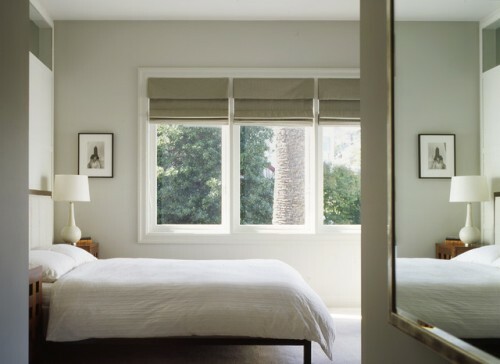 Do you like reading tips on how to arrange a bedroom with a large window?